Ozhotels is a group of independently owned and non-related hotels, motels and serviced apartments located across the Sunshine Coast in Queensland, Australia. Ozhotels allows you to deal directly with the apartments and hotels, therefore giving you the best possible rates for this Sunshine Coast accommodation. Book hotels and apartments in Mooloolaba, Maroochydore, Noosa and Alexandra headland online directly and save save save!!! Located an hours drive north of Brisbane the Queensland Sunshine Coast is a region that is filled with many different places in which to enjoy a relaxing holiday with either family of friends. Boasting warm, sunny weather and marvellous beaches the Sunshine Coast is the ideal holiday destination for international tourists looking for luxury resorts, families wanting a relaxing holiday or couples who want a romantic time away together. The Sunshine Coast features plenty of exciting things to see and do, as well as having a wide variety of luxury and budget priced apartment accommodation available to suit the needs of all sorts of travellers. The Sunshine Coast region consists of numerous townships and cities that contain thousands of different accommodation options. For this reason many people prefer to use the free services of an accommodation expert like OzHotels in order to save themselves lots of time and money. This is because Not1Night allows you to search through all of the available properties, book your travel up to 12 months in advance and also gives you a discount off the already cheap rates the longer that you holiday on the Sunshine Coast. Situated on the northern end of the Sunshine Coast, Noosa is clearly one of the best holiday spots in Australia. The main beach in Noosa features golden sands and faces north, which makes it perfect for swimming and playing with the kids. Hastings Street in Noosa is famous for its many fine dining restaurants, cosmopolitan cafes and boutique shops. Some of the many things that you can do when staying in Noosa include surfing, kayaking, fishing, kite flying, rock climbing, boating and cruising on the tranquil Noosa River. There is also plenty of places to visit around Noosa, such as Fraser Island, the tranquil Noosa National Park, Australia Zoo and tours along some truly amazing coastal scenery. 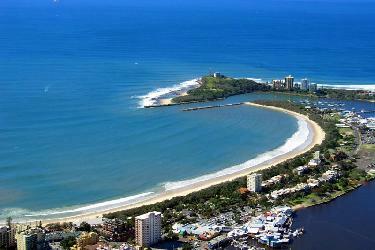 Mooloolaba has over the years become one of the most popular holiday destinations in Australia. It is located on the Queensland Sunshine Coast just south of Maroochydore and features a wide variety of boutique shops, award winning restaurants and lots of trendy cafes. 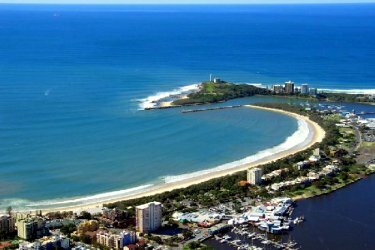 Other tourist attractions in Mooloolaba include the beautiful surf patrolled beach, Steve Irwin's Australia Zoo, Underwater World, The Wharf, scenic river cruises, fishing tours and local open-air markets. If you want to relax on your Sunshine Coast holiday then take a scenic drive inland and visit galleries, wineries and country pubs. Alternatively the more adventurous may want to scuba dive at the HMAS Brisbane which was sunk in front of Mooloolaba or even swim with the sharks at underwater world. The Sunshine Coast region of Alexandra Headland is ideally located just 10 minutes from the Maroochy airport and 1 hour from the Brisbane airport. When you choose Alexandra Headland for your next Sunshine Coast accommodation you can stroll along the area's pristine beaches, or walk to the numerous restaurants, cafes, shops and entertainment venues in both Alexandra Headland and nearby Mooloolaba. Holiday makers to Alexandra Headland can also surf or swim at the safe patrolled swimming beach, enjoy a meal and drink at the famous Alex surf club or visiting some of the many Sunshine Coast tourist attraction that are close by, such as Australia Zoo, Underwater World, Eumundi Markets, the Big Pineapple and Fraser Island. 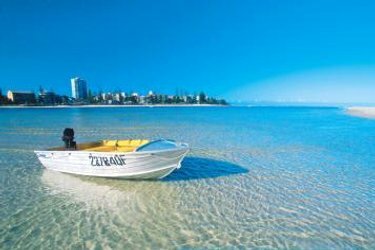 Caloundra is known as the southern gateway to Queensland's beautiful Sunshine Coast and is conveniently positioned 1 hours drive north of Brisbane. It is a popular holiday destination with travellers because of its warm climate and year-round sunshine. 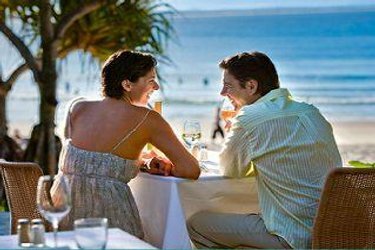 At Caloundra you will find a range of cosmopolitan restaurants, cafes and shops as well as the clear waters of Pumicestone Passage and many beautiful beaches including Golden, Currimundi, King and Dicky beaches. 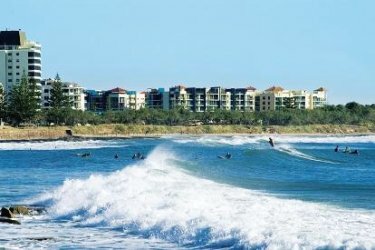 Caloundra provides a wide variety of accommodation on the Sunshine Coast and families, couples and friends will really appreciate the many fun activities that are on offer, including surfing, swimming, fishing, windsurfing, kayaking, go karting, skydiving, scenic flights and, most importantly, relaxing. The Sunshine Coast accommodation in Coolum is perfectly situated between the Sunshine Coast airport at Marcoola and the vibrant district of Noosa, making it a peaceful and relaxing place to stay. 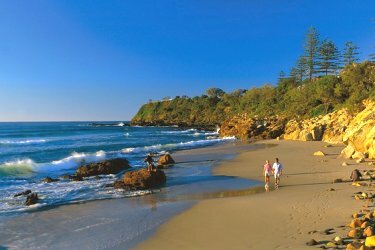 Coolum features a beautiful beach where you can swim and surf as well as many restaurants, shops, cafes and even 3 world class golf courses. There is lots to see and do when you stay in Coolum including visiting the bustling local markets, exploring the art galleries, take the kids to Australia Zoo or learn all of marine life at Underwater World. There is even a hiking trail to the top of Mount Coolum where you can marvel at the majestic hinterland hills with their subtropical rainforests and the pristine beach laid out below. Maroochydore is perfectly positioned in the middle of the Sunshine Coast, halfway between Caloundra in the south and trendy Noosa in the north. The city of Maroochydore is on the banks of the South Maroochy River and features lots of shops including the Sunshine Plaza with over 250 speciality stores and a 12-cinema complex. Because of its central location Maroochydore is a great accommodation base from which to see the wealth of natural wonders that the Sunshine Coast has to offer including golden beaches, beautiful rainforests, rivers and scenic lookouts. Close by to Maroochydore is the world famous Australia Zoo, the Big Pineapple, the Ginger Factory, Ettamogah Pub, Underwater World and the remote beaches of Bribie Island. The Sunshine Coast Hinterland takes in a large region inland from the clear, blue waters and beautiful beaches of the coast. Situated only 90 minutes north of Brisbane the hinterland area takes in the heritage listed Glasshouse Mountains as well as the Blackall Ranges where the townships of Maleny and Montville provide some amazing food, wineries and galleries. 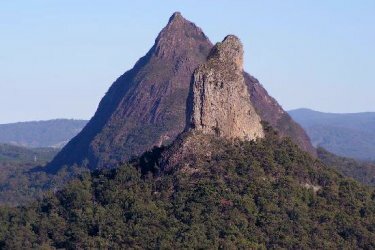 Dominating the Sunshine Coast Hinterland are the Glasshouse Mountains which are a series of steep volcanic plugs with a remarkable lookout that also doubles as a great place for a BBQ picnic. Some of the great activities that you can enjoy when you stay in the Sunshine Coast Hinterland include bush walking around the mountains, rock climbing, abseiling, skydiving and even hot air ballooning. The Sunshine Coast region has a plethora of different places that are ideal for a long or short term holiday. This includes the Catalina Resort Maroochydore, Coolum Seaside Apartments, Sheraton Noosa Resort & Spa, M1 Holiday Resort Accommodation, Sandy Shores Luxury Holiday Accommodation, Capeview Apartments Caloundra, Sunshine Coast Motor Lodge, Burgess @ Kings Beach Apartments, Casablanca Beachfront Apartments Caloundra, Cerulean Caloundra Apartments, Cheltenham Apartments Kings Beach, and the Estoril on Moffat Beach. In order to book in at these or any of the other holiday accommodation on the Sunshine Coast then click here to make an enquiry.